The Tradewinds Outdoor Bar Height Gas Firepit brings a romantic feel to your outdoor backyard area. Each outdoor bar height fire pit has a base with deep mahogany, resin bamboo shafts and a realistic basket weave background, with your choice of a 48" diameter granite table top in Sunset Gold, Pebble, or Sea Green (see below). You can also convert your Tradewinds firepit into a cooler top table with the purchase of an ice bucket and adaptor ring, or it can become a grill with the stainless steel grill insert . These table tops are easy to maintain as there are no grout lines that will crack or mildew. You have your choice of burning element using either ceramic gas logs or colored glass (Clear, Smoke, or Bronze) for an additional cost. 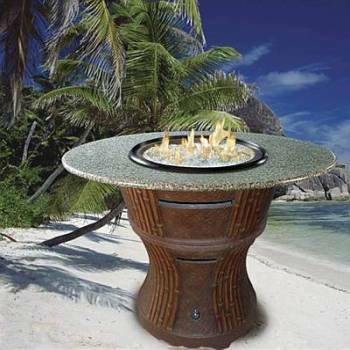 The Tradewinds Chat Height Firepit comes in a 41-1/4" tall bar height, or 40" without the granite top. At the bottom, the base measures 30", and the base is designed to hold a standard, 20 lb. LP tank. All units are shipped LP Propane gas ready, unless you designate natural gas on your order (at no extra charge for a limited time), and comes with a matching granite insert and a vinyl cover. Combine this beautiful mahogany Tradewinds Firepit Table with your choice of a granite table top and wrap your outdoor, living area in a casual sophistication. Each table is made to order, and the assembly is fast and easy for 2 people. The beautiful 1 1/4" thick granite table top is all weather resistant natural stone. The adapter ring is required with the grill or ice bucket option.